My experience as a buyer of orchids. As you know, I buy my orchids in flea markets or exhibitions of orchids. Although it is also possible to buy online, online shopping is not very popular here and is best done when you know a couple of reputable nurseries. But I’m willing to buy online in the future! Depending on where you buy orchids, I have to take into account many variables which they may, or may not vary from the situation. I also would like to share some tips for my countrymen (Colombian) according to my experience. -First, you have to know the place where you are. -The flea markets are various events. -In the flea markets, you find mostly farmers and small-scale trade. -They pay a relatively small price to local government that seeks to help them promote their products. -Orchid exhibitions are organized events a few times a year. In the exhibitions, you find the largest and most famous in the country nurseries. They pay a very high fee to any private organization, generally a society of orchids, which seeks to organize large-scale events for citizens and tourists. None of these options is better than the other if one knows what to expect. So this is what I have in mind: Both options offer a variety of orchids. Exhibitions, especially during the Feria de las Flores, They are much larger than flea markets, but as markets are more frequent and always offer something different, we can conclude that you can find almost everything everywhere. The difference is that, unlike the peasants, large nurseries may have laboratories, so if you’re looking for a particular type of orchid, they can give you in vitro or slight (what you want) plants. If you are looking orchids identified, flea markets are not for you. Magnificent orchids are worth more for its intrinsic value that by their “parents” or displays their potential value. But if you’re lucky and you find a label on a flea market, you can be pretty sure that name is reliable. In most of the commercial and their customers do not care about labels, so sometimes get marked orchids of excess inventories of large-scale importers who they buy their orchids reputable nurseries in the United States, for example, but they do not add extra charges to the fact that the orchid is identified. Moreover, local nurseries in exhibitions not only sell imported orchids but also they sell divisions grow orchids themselves, so, in the end, you have to trust that the marked orchids they are a division of a certified elsewhere orchid. It is paradoxical, but I have many orchids US I bought in flea markets, while most labels orchids buy at exhibitions are handwritten. While the price range in flea markets is very broad, you can find many beautiful orchids at very affordable rates. Orchids can also be found in some of the bigger garden-parks around the world. Moreover, orchid’s exhibitions are so expensive that sometimes it is ridiculous. If you invest a large sum in an orchid in a show, better you are sure you want this orchid and not get elsewhere. At flea markets, you can also negotiate directly with the seller, so you get some discount. As much as you want to help sellers, they know they have to set a price that gives them a high-profit margin, so in some cases, they sold orchids even two or three times the value they believe it. If you are a good customer and negotiate directly, they end up being very friendly and not only get discounts, but you just give other plants that do work can flourish. On the other hand, in orchid shows you talk mostly with employees of nurseries, who have strict orders not to give any discount to its already very expensive and orchids. In both places, I have received healthy and diseased orchids. If you have some primary criteria on how to see a fresh orchid, you have to buy the orchid and just treat it and transplant it when you get home. Do not expect to find fresh orchids all the time, but if you know how to handle them, you’ll be happy with your purchase wherever they may be. My two basic tips: In the flea markets you will always find different orchids every time, So here not worth going to look for something in particular, but better to be surprised. Also, if you see an orchid that you like, buy (Unless either the Catalog abode, that is always there), because it is very likely not find again soon. Moreover, in the exhibitions better you know exactly what you want in advance. First, because if you let yourself be carried away and buy a lot of orchids, you see and like for the first time, you’ll end up spending a lot of money in orchids you could find a better price elsewhere. Second, large nurseries, in fact, offer orchids that you will not find elsewhere. As customers here Šestan not so obsessed with identification and are driven more by appearance (flower) identified orchids belong to a niche market, so it’s better to pay the price of a strong guarantee. In the flea markets, you have to look carefully. There are many exotic orchids that cannot survive in your environment and can come without roots or full of diseases and pests, so you should choose not only an orchid you like but a large enough so it can withstand the stress of being introduced to your environment. And if you fail to take care of, the seller could replace it, but then different orchid, because they do not have enough ‘stock’ to offer many specimens of the same class. Then at the end you could lose your beautiful orchid but sick anyway. On the other hand, if you get an orchid tired of a large nursery in an exhibition, you could have the options available to contact them, assistance and even a replacement of the same specimen in better condition. In general, you have to choose nurseries with good image and communication channels. Once you become your customers, they will never let you go. I hope you have learned a little more about my experience buying orchids! Maybe we could exchange our EXPERIENCES as customers for we make right decisions as we build our collection. Posted on November 18, 2016 January 12, 2017 Leave a comment on My experience as a buyer of orchids. There are small and big gardens across this planet decorated with beautiful flowers, trees and bushes. Some are greater than others and that’s not just their size, these gardens are almost like parks in which you often do not stroll around. Here you use electric vehicles like scooters, golf carts and in some cases Segways. That is how big these places are. If you want to be able to enjoy everything in one day you will have to be able to move a bit faster than walking speed, if you don’t feel like running through them that is. Beneath you will find a list of the 5 largest gardens in the world, and what type of transportation you’ll be granted within each. The largest flower garden in the world can be found in Dubai, United Arab Emirates. This garden is called “The Miracle Garden” and consists of mainly flowers and bushes. The Garden is located in the middle of the Dubai desert. Now who would put a beautiful massive flower garden in the middle of the desert you might ask yourself. Well aren’t Dubai famous for their: “You tell me I can’t and I’ll prove you wrong… BIG TIME”. That is probably why. Because they can and want to. They’ve even built 3 palm looking sand islands and the highest tower in the world so how hard would a little flower garden in the desert be? During your visit in the Miracle Garden, you will find that they have excellent transportation in terms of various high-performing models of electric scooters, one could think that a country that is based on oil would use something that runs on gasoline, but no. The garden is Eco-friendly and therefore only use electronic transportation and tools. The second largest flower garden on earth is the Keukenhof Garden . It has 75,000 tulips grown in over 600 varieties. Situated in Lisse, Netherlands, Keukenhof is the world’s biggest flower garden. Its name symbolizes “Kitchen Garden” in English and is otherwise called the Garden of Europe. This well-known garden includes more than 7 million flower knobs, which are planted in the garden every year. Keukenhof encompasses 32 hectares of land. It also offers segways to walk around on the concrete path but not on the beautiful Lawns. For a rich, wonderful garden with the storybook offer, you require just go down under to Pokolbin, Australia to the Hunter Valley Gardens. Separated into ten unmistakably styled gardens that range from the Indian Mosaic Garden to the Formal Garden, this delightful gathering of greenery is the ideal garden for families. Guests can wind through the Storybook Garden to discover bright mosaics and characters from your most loved nursery rhymes.Compared to different gardens far and wide, the Hunter Valley Gardens are moderately new. Charge and Imelda Roche obtained the property in 1997, took five years to develop and build up the land, then opened the patio nurseries to the general population in October 2003. The Hunter Valley Garden Facebook page guarantees that the patio nurseries contain more than 6,000 trees, 600,000 bushes, and beautiful 1,000,000 ground covers. They offer electric bicycles to roam around. Arranged at the foot of Table Mountain in Cape Town, South Africa, the Kirstenbosch National Botanical Gardens contain more than 7,000 particular plant species. Alongside an unsurpassed gathering of indigenous greeneries, albinos, and other vegetation, Kirstenbosch likewise includes various littler themed gardens. One of these patio nurseries is the Medicinal Garden, which ensures different plant species that are known for their therapeutic uses. Kirstenbosch was established in 1913 as the world’s first natural garden made with the expectation of saving South Africa’s extraordinary vegetation. They will take the visitors in the electric car to the visit each section of this large flower park. The first (and most famous) of South Africa’s nine National Botanical Gardens, Kirstenbosch is secured as a UNESCO World Heritage Site. The suitable time to visit is spring, when the South Africa’s national blossom, the protea, are sprouting in the Protea Garden. Get a plane to Pattaya, Thailand to investigate the first Nong Nooch Tropical Garden. The garden covers more than 500 sections of land of land, with its space separated into various littler gardens, for example, the Canna Garden, Butterfly Hill, Blue Garden and the Stonehenge Garden. Besides lodging the biggest assortment of orchids in Thailand (more than 650 species), Nong Nooch Tropical Botanical Garden likewise has an on location Cycad Genebank, which safeguards and ensure cycad species that are going wiped out. They will provide transportation in electric scooters. Hi everyone, welcome back to my post. I have made up a list of my top five beginner orchids that I think anyone was just getting into orchids should look into these five. Starting with the fifth one, we are going to be talking about Cymbidium’s. Cymbidiums are a wonderful orchid. It’s an orchid that’s on the large side so it’s hard to have a house full of them. But they have beautiful strappy Leaves, and flowers bloom in the middle of winter when you need them the most. Next on the list is Cattleya Orchids, Cattleya Orchids are beautifully easy to grow orchids. These flowers are not meant inside the house on the windowsill, or under lights in the house. These are grown in warmer temperatures, the trick to getting this tore bloom is in the springtime or the summertime When the Bulbs are mature, you want to give them a slight drop in temperature. So keep them outside in the summertime, as long as it’s nice in your area and that should Stimulate flower growth for the fall. Number three, number three for me is on Oncidiums and all their hybrids. Oncidiums are fantastic orchids they are easy to grow. They are very temperature tolerant they can take nighttime lows down into the 50s, and they can take room temperature as well. You can put them in a sunny east or west facing the window, Keep them out of direct noonday sun through the plain glass. Oncidiums flower on the newest bulb, so once that bulb is fully mature, you want to give it a slight chill in temperature, maybe five or 10°. So if the room is 70 try to bring it down to 65° and that should stimulate flowers for you. And number two on the list is Dendrobium Phalaenopsis. Dendrobium Phalaenopsis are beautiful orchids. They flower two or three times a year. They flower off Old canes, and they take very little night time drop in temperature to get them to rebloom off those old canes. They always seem to be in growth, and it always seems to be in Spike or flower. And the number one favorite orchid that I think all beginners should start out with. It is a Phalaenopsis orchid or a moth orchid.They are beautiful orchids, very easy to grow, come and all kinds of colors. Anything from white and purple to mixed oranges and speckles anything you can imagine. They come in all sizes, like the minis here. And they come in large sizes as well. Something That is going to fit into anybody’s home, they don’t take much light, They don’t take much care, water them just as they’re approaching dryness and they’re going to do the rest for you. So anyways guys, that is my list of great orchids for beginners. Remember that list goes, number five Is Cymbidiums; number four is cattleyas, third is Oncidiums and their hybrids. Number two is Dendrobium Phalaenopsis and the number one orchid that I think I’ll beginners should start out with is going to be the regular moss orchid or the Phalaenopsis orchid. Anyways, guys, I hope you enjoy those tips. It’s a harsh reality of the circle of life: Flowers aren’t meant to last. However, thanks to chemistry, you can help them live just a bit longer. To keep cut flowers fresh, you’ve got to fight the flower’s healthy aging processes. Plants have a straw-like system called xylem to transport water using surface tension. When the stems are cut, air rushes into the xylem, blocking the water system. When you’re ready to put your beautiful bouquet in a vase, follow these steps. It sounds simple, but a little soap and water can go a long way to preventing bacteria and fungi from invading your bouquet. If you’re motivated, you can even clean the vase and refill the water every day, for maximum disinfection. Step 2: Flowers need water. So fill up the vase. Flowers need water, duh. But it’s a little more complicated than that. It’s best to use warm water (110 dF) and slightly degassed, meaning entrapped air has been allowed to escape. The simplest way of doing this is to fill up a vase with warm water and let it sit for a few minutes. The quality of the water also affects the life of the flowers. Plants prefer slightly acidic water (pH 3). Step 3: Feed your flowers next, add the little packet of “flower food” from the florist. It has bleach or some other microbe killer. The bleach helps the disinfecting process by killing any microorganisms that are trying to eat away at your flowers and make it harder for them to thrive. This lemony goodness reduces the water’s pH, which in turn helps water travel up the xylem faster and reduce wilting. It has sugar! When carbohydrates are low, flowers wilt and petals become paler. To prevent this, sucrose or glucose can be added from the packet to help the flowers regain strength and beauty. That’s what candy bars do for us, right? But be careful, microorganisms and bacteria LOVE sugar, so that’s why you shouldn’t just dump table sugar into your vase — you need everything in that little packet. Step 4: Cut the stems Run the stems under water and cut off a bit from the bottom of the stem at a 45-degree angle. This ensures a wide opening to the xylem and keeps air bubbles to a minimum. Also, try not to cut the leaves. The leaves are how the plant gets energy — photosynthesis, remember?! Once you made your snips, put them those bad boys in the vase. Step 5: Keep them away from ripe fruit produces ethylene, which tells a plant to ripen. Faster ripening = faster aging = dead flowers. Step 6: Keep them cool Finally, try to keep your cut flowers cool. If you’re going to leave the house for a day or two, stick them in the fridge (just not too close to any ripe fruits or veggies). This reduces microbial growth and decreases the plant’s metabolic rate, slowing the aging process. Kind of like that futuristic cryogenics stuff we’re trying to people, but not quite as sci-fi or expensive. There, you’ve done it! Congrats! Smell those roses (or lilies or tulips or whatever) while you can. Tell us your favorite plant in the comments, and of course let us know about future episodes you want to see. Posted on October 28, 2016 October 18, 2016 Leave a comment on How to Make Flowers Last Longer? We’re going to learn all about transplanting daffodils. Now, daffodils are one of the first flowers to bloom in the spring. Daffodils so beautiful, and they come in so many gorgeous colors, and shapes, and sizes, and there are short ones and tall ones. And they can be forced inside in the winter. They can be planted out in the ground in the winter and to bloom in the spring, and they’re just the most beautiful flowers. But how do you transplant them, and when do you transplant them? And my theory pretty much is every plant that can survive the winter can be transplanted any time it’s not blooming. So really, daffodils can be transplanted in summer, fall, winter, or even early spring, and they should do well any time of year. I mix the daffodils with the tulips and the lilies, and they all bloom throughout the year, and they do wonderfully. Each spring, I always put some daffodils in some containers, cause’ I just think they’re so pretty how they are so dainty, and they come up in the containers. By the fall they die back, and the bulbs don’t have them and they just kind of sit there so that I could leave them in the containers and they’d come back from year to year, but usually what I do is I transplant them back into the ground. So, you take them out of the pots, and they’re just little bulbs. Right now, they’re dormant because they have already bloomed. And I like to plant them in groups of threes, so when I plant them, I like to put them in a triangle. Now, this dirt is worked up pretty well, so it doesn’t take too much for me to dig a little hole. So, I’m planting them in groups of three in a triangle. Going to try to put them about three inches deep or zigzag them, but I try to make them into a triangle six inches or even three inches apart, cause’ it’s not a big area of my garden, and then I just cover them up. It’s best not to leave the daffodil bulbs out of the ground for an extended period because they do because they will always do better in the ground than out of the ground or in a container better than out of the container. So, transplant them any time of the year, and you’ll find that they’ll come back and do beautifully every spring for you. Where is such a wide array of white that’s available all year round that certainly you can count on white in any season. The trick is to open your mind a little bit and to consider also ivory shades and to consider white in all its various hues. Sometimes I have a bride who will come to me and have a swatch. She’ll have a swatch of either her dress or a bridesmaid dress, particularly when it comes to white and wanting to match white flower with a white piece of fabric or a white ribbon. It’s never a good idea. The best idea is to try and have white flowers with a dress that’s not white. If you have a wedding dress that’s ivory and you have white, white flowers, the flowers are going to look more bright white than your dress and vice versa. 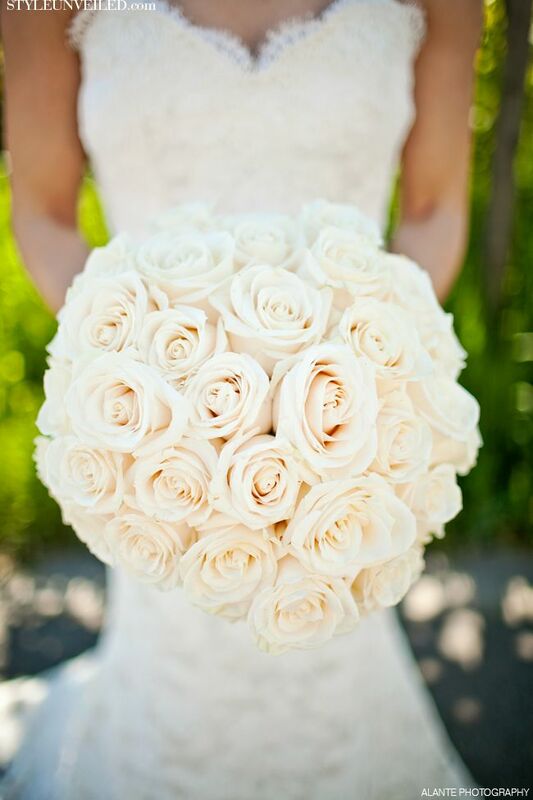 If you have a very bright white dress, you can have flowers that actually range in flowers from white to ivory. If you’re interested in matching exactly, you’re going to be disappointed. To be open to the possibility that flowers come in their natural state ina whole broad range of white colors and to have a bouquet that is going to be a range of those whites, a range of ivories. It also gives it a little more texture. Another thing to consider with white flowers, particularly regarding bouquets, is that it’s an excellent idea to add some pop off some color, again, to give it more texture, to make the bouquet a little more vibrant, and to break up space a little bit. Certainly, with centerpieces, this is also helpful. Consider for an all-white, monochromatic look adding a little bit of purple, a little bit of gray, maybe a little bit of brown, something to give it just a little bit of pop of something. I think you’ll be pleased, even more, pleased than say with an entirely monochromatic spectrum for the white. Posted on October 18, 2016 Leave a comment on White wedding flowers.